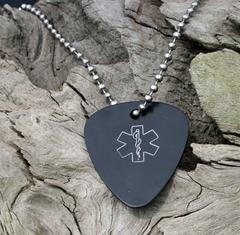 Guitar Pick medical id alert necklace is not only fun, but also a unique medical necklace that is perfect for boys, girls as well as adults. Now your rock star music fan can really enjoy wearing their medical alert jewelry with their very own guitar pick med id alert necklace! Our new fun stylish guitar pick medical alert jewelry necklace is anodized aluminum, measures 1 5/16 x 1 1/8" and is available is your choice of colors. This comes pre-engraved with the medical symbol on the front and up to 5 lines of custom engraving at no extra charge, as well as a 24' bead chain.